Whether you're a home studio owner or have a fairly complex live rig, the chances are that there’s room for our Peak desktop polyphonic synth in your setup. What follows is a group of diagrams explaining the various decisions you might have to make when you integrate Peak. 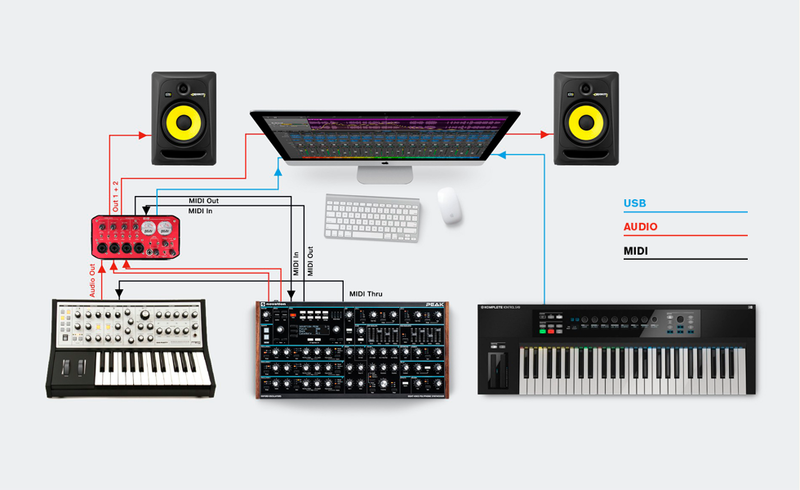 In a home studio setup, you’re likely to have a computer running a full Logic session. 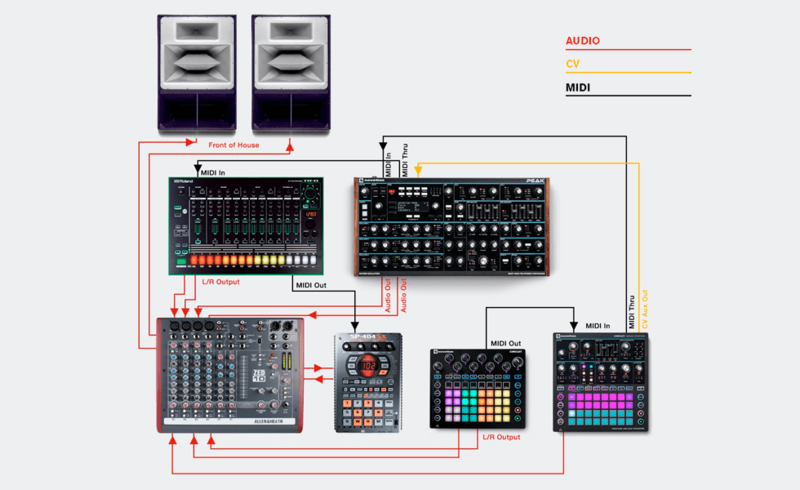 The setup pictured above uses an external instrument channel with multiple MIDI ins for keyboard control and recording automation from Peak. In this case, Peak should be a stereo audio connection. The Moog Sub 37 could be replaced with Roland JD-Xi or Roland JP-08 monosynths. 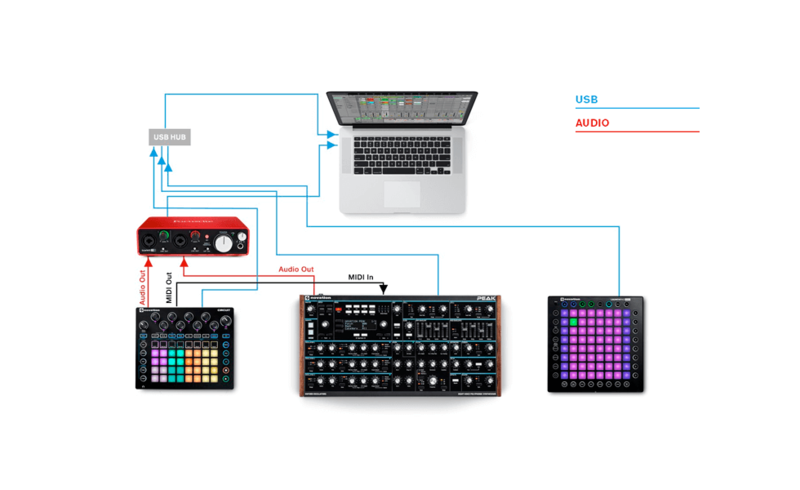 This setup uses an Apple laptop running Ableton Live in performance mode, and a Launchpad Pro in Scale Mode routed to Peak. Not shown are some headphones, connected to the Scarlett 2i2. The Circuit could be replaced with the Teenage Engineering OP-1. 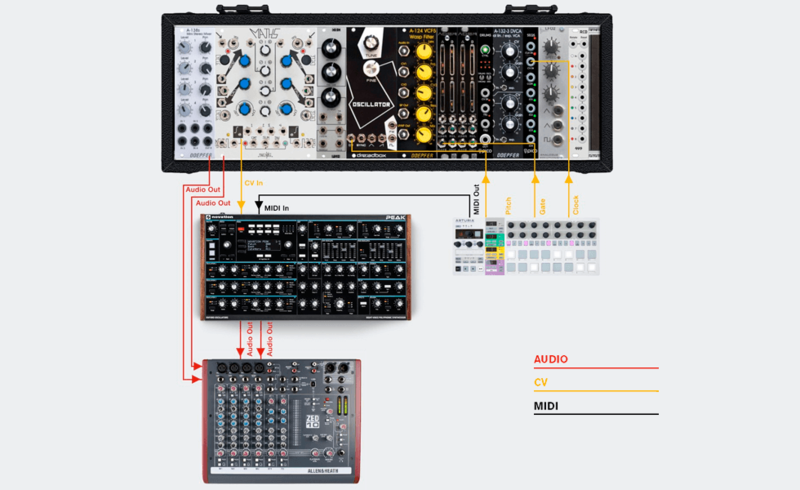 This is a complex standalone setup running off Circuit for clock and looping all the MIDI thrus. Peak MIDI is controlled via Circuit with additional modulation sequences coming from Circuit Mono Station via the auxiliary CV output. A Roland SP-404 is being used as a clocked multi-FX processor of the send and return off the mixer. The Roland TR-8 could be replaced with the DSI Tempest. Here we have a live setup for a keyboard player who wants an analogue synth. Two expression pedals are connected for hands-free control. Sustain will be sent via MIDI to Peak. 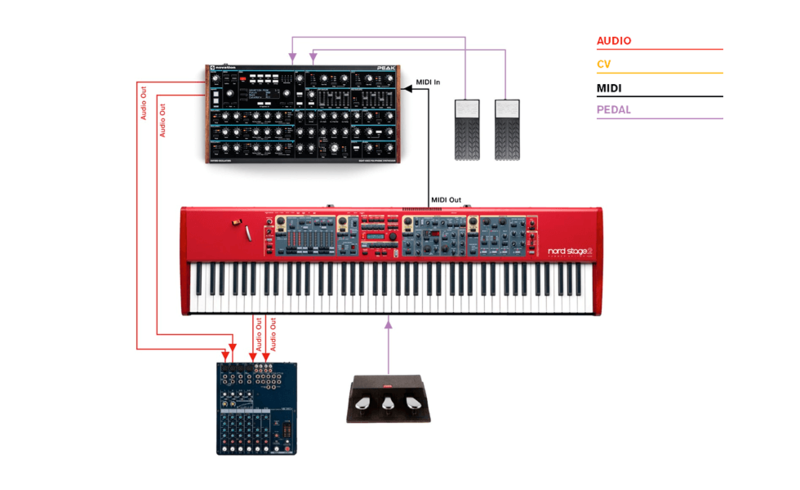 The Nord can be substituted with a Roland JUPITER-50 or JUPITER-80. In this case the BeatStep Pro is the master sending sequences to the modular and Peak as well as clock information over MIDI and CV. Additional CV mod sources can be taken from the modular system to modulate Peak via the CV in.